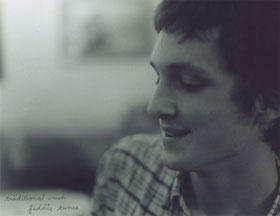 Sam Amidon, aka Samamidon, is a product of the quintessential folk-band family, the Amidons. And on this track, “Saro”, Sam proves that he certainly deserves a place in the First Family of Folk. Saro, like the majority of the songs on Samamidon’s upcoming new album, “All Is Well ”, is actually a retelling of a traditional folk song, “Pretty Saro”. There are countless covers of this song, performed by such great names and Judy Collins, Bert Jansch, and Doc Watson, among others; Samamidon’s version is the most haunting and beautiful I have heard. Although the song has been set with different melodies, and different characters, and even in different times – some songs start off in 1749, others in 1849 – the central story remains the same: An immigrant, alone and flailing in a strange country, misses his true love back home. This version by Sam is sung in a resigned, yet achingly beautiful voice, and is accompanied by composer-friend, Nico Mulhy’s amazing string and wood instrument arrangements. There truly is nothing else to say, except that Samamidon is on the cusp of greatness. Without question, his will be the definitive version of this song. Below I’ve included both the music video for the single, “Saro”, and, of course, the song itself.